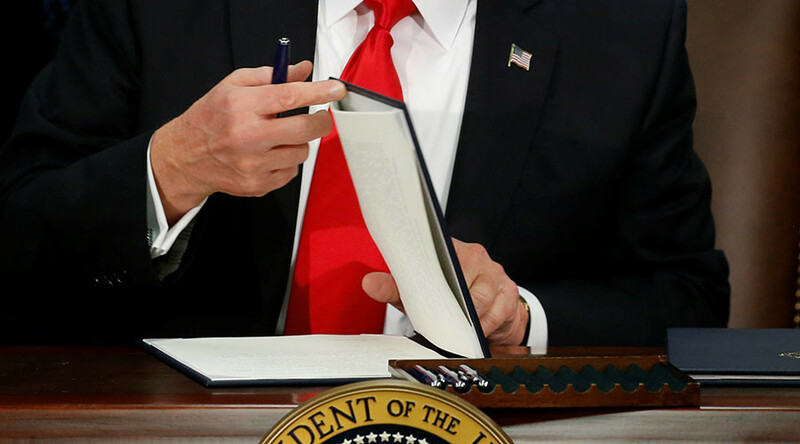 President Donald Trump has signed orders to step up immigration enforcement and secure the US border, beginning with building a border wall with Mexico he promised during the campaign. Jurisdictions that harbor illegal immigrants may lose federal funding. The second order aims to empower Immigration and Customs Enforcement (ICE) and “strip federal grant money from sanctuary cities and states that harbor illegal immigrants,” according to Spicer. Federal agencies will “unapologetically enforce the law, no ifs ands or buts,” said the White House spokesman. “A nation without borders is not a nation. Beginning today, the US gets back control of its borders,” Trump said Wednesday afternoon, addressing the DHS and its newly sworn-in secretary, retired Marine General John Kelly. Trump said he would discuss how to dismantle the drug cartels and stop the flow of illegal weapons from the US into Mexico in an upcoming meeting with his Mexican colleague, making an oblique reference to the “Fast and Furious” scandal during the early years of the Obama administration. One of Trump's key campaign promises was to construct a border wall with Mexico. The new president announced the measures Tuesday using his personal Twitter account. Construction on the border wall will begin “as soon as we can physically do it,” Trump told ABC News in an exclusive interview. Actions envisioned under the orders include hiring 5,000 additional Border Patrol agents, according to congressional aides who spoke to Reuters on condition of anonymity. During the campaign, Trump frequently blamed sanctuary cities for the deaths of Americans at the hand of immigrants who were in the country illegally. Among the cases he would bring up was the July 2015 death of Kate Steinle on San Francisco’s Pier 14. Steinle’s killer, Juan Francisco Lopez-Sanchez, had been deported from the US five times but kept returning. Trump’s border wall “panders to hatemongers” and the order to “retaliate against cities and towns that seek to protect their immigrant communities and families is equally outrageous and anti-democratic,” the CCR said in a statement. Wednesday’s orders do not address refugee admissions or visa policy, as media previously reported citing unnamed insider sources. Such measures may be implemented later in the week, the White House said. Among the actions supposedly under consideration would be a 30-day temporary ban on all refugees entering the US, capping the total number of refugees accepted in 2017 at 50,000, and suspending the issuance of visas to citizens of Syria, Iraq, Iran, Libya, Somalia, Sudan and Yemen.